Bulgarian food is tasty, fresh and hearty. Bulgaria is famous for its quality vegetables and dairy products and its variety of mild spices. 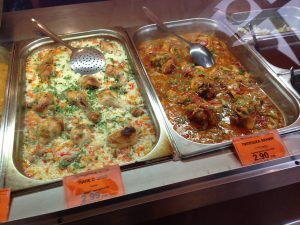 Pork and chicken are the most common forms of meat, though seafood, fish and veal dishes are also popular and lamb has a special traditional place in Bulgarian cooking. On a recent visit to Vidin I had a chance to taste the fresh fish from the Danube – amazing, and less than $5 at a restaurant by the river. 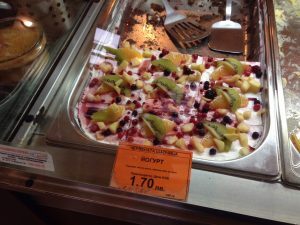 The photos are from a deli in the center of town. 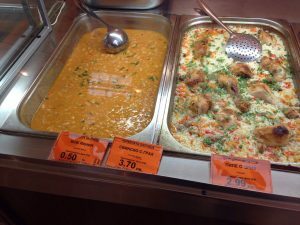 The chicken with rice or vegetables is at about $1.50/portion, fresh yogurt and fruit $0.90, bean stew $0.25.